It is precisely for reasons such as these that this disclosure must come from we, the people. This is the reason for the movement, and this is why Dr. Greer and his team are pushing for a full and complete disclosure of all information that has been hidden from the world for the benefit of a few. Before continuing, I would like the note that I do not entirely agree with Dr. Greer's stance on the subject of ETs. I do agree that there is nothing to particularly fear (as fear is an emotional choice which is detached from any real situation). I would also agree that there is no reason to worship anyone we may meet in space. However, this does not mean that there are not specific precautions which we aught take in order to maintain peace safety within our solar system. According to those who have frequently visited space and spoken with a variety of ET life, it has been a common observation that violence can and does happen. However, again, this is not to say that we must fear anyone. Rather it is important that we approach the situation with a healthy balance of caution and optimism. This way, we can manifest the experiences we want as opposed to those we do not, and by establishing peaceful agreements with all of those we may come in contact with, we can be better able to maintain the ideal environment for both ourselves and anyone who stops by for a visit. With that, here is Dr. Steven Greer. Consider: One scenario for disclosure is that the UFO and Extraterrestrial subject is acknowledged in a way which is scientific and hopeful. Excessive secrecy which lacks executive branch and congressional oversight is ended. Humanity begins to entertain open contact with other civilizations, with peaceful engagement as the goal. Technologies which are currently suppressed are allowed to be disseminated: Pollution ends. An economy of abundance and social justice is firmly established. Global environmental destruction and mind-numbing world poverty become a faint memory. Zero-point based energy devices transform the world. Electro-gravitic devices permit above ground travel without paving over the world's precious fertile farm land. As an ET once told Colonel Philip Corso, "Its a new world, if you can take it...". This is the disclosure which we are working for. Military interests, which are heavily involved in covert projects which hoax ET events, such as human military- related abductions, have a shared goal of demonizing the UFO/ET phenomenon. Doing so lays the foundations for the fear and dread necessary for an organized opposition to all things ET. And this subserves the longterm need to provide a rationale for an expanding global military even should world peace emerge. Looking for books, DVDs and more from Dr. Greer? Check out our store on the link below! I appreciate all of the hard work the Disclosure Project team have done over the past 20 plus years. Without them, many of us would have no idea that there was anything else to know behind the song and dance of visible government. As I have stated previously, there are numerous aspects of the story which seem to be unfolding by the day. 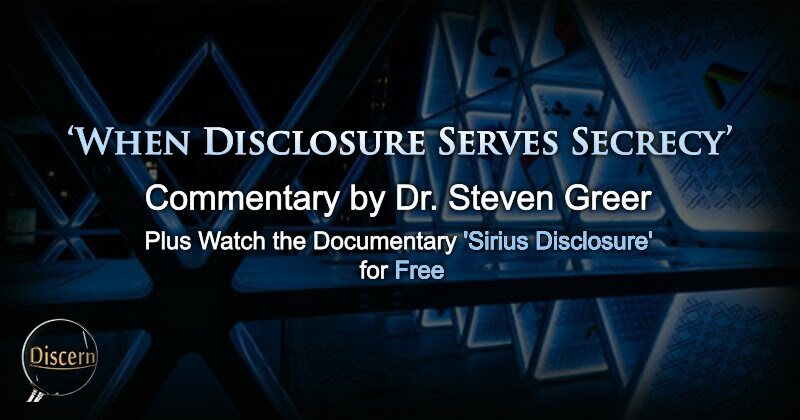 Dr. Greer and the Disclosure Project first brought to the table the first-hand testimony of those who professionally dealt with E.T. 's and their spacecraft. These brave men and woman also brought a bounty of authentic, official documentation which proved their respective testimonies to be true and valid. Along with their vital contributions, we have the work of Dr. Michael Salla. Dr. Salla was one of the first whistle-blowers to come forward with first-hand knowledge of the inner workings of some of the special access programs to which Dr. Greer may have been referring. One particular program is currently termed the "Secret Space Program". Dr. Salla was first able to give numerous details about the dealings of this off-world militarily-based establishment. Years later, we have a number of other former operatives within these off-world programs coming forward with extraordinary stories of the beings they encountered, the technology they used, and the experiences they had. Michael Relfe, Randy Cramer, and Corey Goode have each risked their reputations, their present-day careers, an even their safety to bring these testimonies forward. The information is vast, and it can require quite a mental investment to wrap one's head around the complexity within it. What is most interesting is that the accounts of these three men seemed to line up well with one another even before any of them had ever met. On top of the hazards these men face for the sake of the truth, there are numerous online interests attempting to discredit everything they say. These trolls use every trick in the bag to distract would-be readers from taking interest in this very vital information. (This typically comes in the form of rude and/or distractionary comments, and character attacks.) It should be known that when a person fabricates a story, they don't typically get harassed by trolls as intensely as people such as Corey Goode, David Wilcock, and others. It stands to reason that the powers that be have very much to loose from the simple sharing of information. This clearly suggests that the testimonies of all of these men are of great value and deserve to be examined. The situation is reaching a climax, and the powers that be are doing everything they can to hinder the process, but they do little harm. The message is already out. The truth is already spreading, and change is in the air. If you haven't seen articles such as this in the dozens, expect to. The truth is getting out, and these brave man and women are doing their part. Lets make sure to do ours.